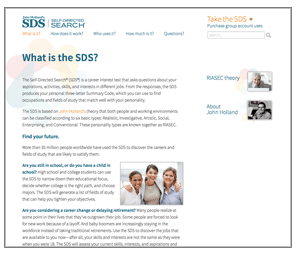 An online career test helps you find career job opportunities, career job descriptions, and career search sites. With a job career test, you test your own job aptitude. Myers-Briggs Type Indicator®, Myers-Briggs®, and MBTI® are trademarks or registered trademarks of The Myers & Briggs Foundation in the United States and other countries. Strong Interest Inventory® is a trademark or registered trademark of CPP, Inc., in the United States and other countries. 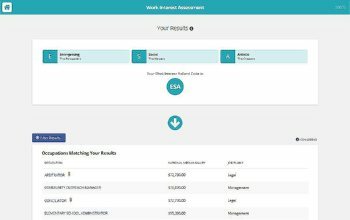 The RIASEC Inventory gives you a fast and informative way to explore occupations based on your interests. The inventory is a valid way to explore different career options. Using the RIASEC system developed by John Holland--the most widely used occupational interest coding system available. Use this inventory to identify their job interests. Complete only 72 work activity statements. Match results those interests to potential careers. The Holland Code inventory, a quick and easy assessment, is perfect for job seekers who have little time to spend on testing and career exploration. Here is video that provides a RIASEC Inventory overview. The second video tells details about the Holland Code Model. The cost for the online RIASEC Inventory is $5. 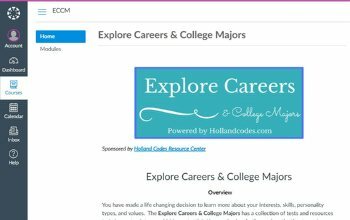 Explore Careers and College Majors System is a personalized, online, interactive, self-guided career planning and college planning system. 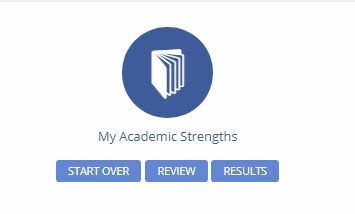 The Self Assessment section begins with the My Academic Strengths. Subjects "I do very well"
Subjects "I don't do well"
"I never took this subject"
There are detailed instructions for each assessment. 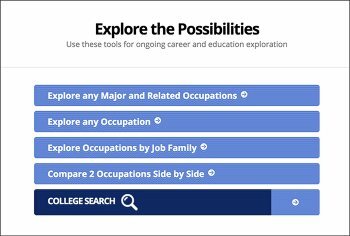 The Explore the Possibilities is the Career Exploration, the College Major Exploration and the College Search sections of the Explore Careers and College Major System. You perform personalized career research. You begin narrowing career options. 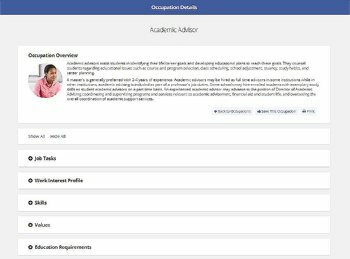 After completing the interests, skills, personality types, and/or values tests, you can personalized occupations to your results and click on any occupation that interests you. 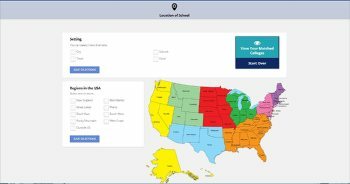 The Explore and Occupation section is designed to help you can access college majors or degree programs. One method is to click on the Explore any Occupation link. 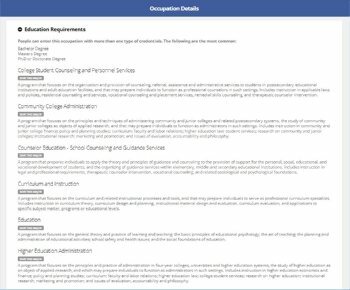 Click on any occupation that interests you. Then, click on Education Requirements. 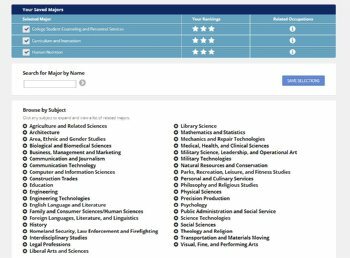 Another college major tool is the Explore Any Major Area of Study That Interests You tool. 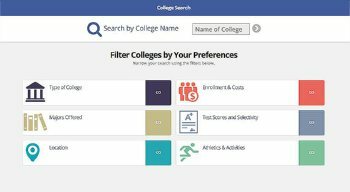 Click on the College Search tool to use excellent college search resources!. The purpose of the Take Action section is to create a personalized road map of your academic and career development activities. Take Action serves as an online portfolio. 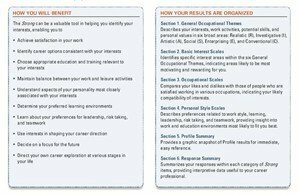 Career and Education Planning Results are a summary of your personalized assessment results and saved preferences. Watch video about the Explore Careers and College Majors System. View video about Explore Careers with College Majors Bonus Tutorial Course. Immediate access to Online Tutorial Course! User Name, Password and Log In Instruction will be sent in an email. The Myers-Briggs Type Indicator® (MBTI®) assessment is the most widely used online personality assessment in the world – more than 2 million assessments worldwide each year. Please Note: Customer will receive User ID number and assigned password by the NEXT BUSINESS DAY. When you complete the test, you will receive a report. Once you are transferred to the Myers-Briggs Type Indicator® (MBTI®) web site https://online.cpp.com, you enter your User Name and Password, and access to the web site is immediate. CPP requires that you receive a free consultation with your purchase. 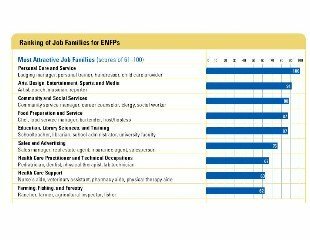 MBTI® Types and Job Families – Job family ranking, Most attractive job families, Moderately attractive job families, Least attractive job families, Most popular occupations, Least popular occupations, and Tips for succeeding in atypical occupation. When you complete the online test, you will receive two reports. Once you are transferred to the Myers-Briggs Type Indicator® (MBTI®) Career Report web site https://online.cpp.com, you enter your User Name and Password, and access to the web site is immediate. 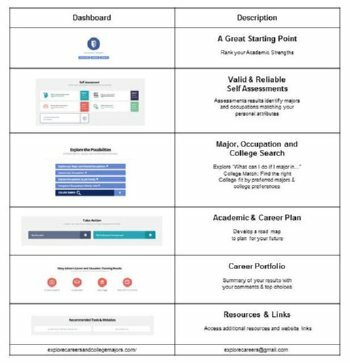 Easy to use - Complete the career assessment in 30 minutes. Tested, proven, and dependable - Used by over 22 million people worldwide. With each purchase, the user receives by e-mail an identification number and password to generate a confidential, eight-to-twelve page interpretive report. For nearly 80 years, the Strong Interest Inventory® assessment has guided thousands of individuals in exploring careers and college majors. The Strong Interest Inventory® assessment is the most respected and widely used career planning instrument in the world. Scores on the level of interest on each of the six Holland Codes or General Occupational Themes. Holland Code Themes include – Realistic, Investigative, Artistic, Social, Enterprising, and Conventional. Scores on 211 Occupational Scales which indicate the similarity between the respondent's interests and those of people working in each of the 211 occupations. 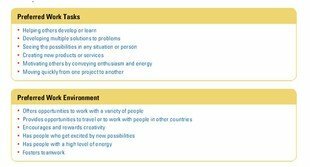 Scores on 4 Personal Style Scales (learning, working, leadership, and risk-taking). Scores on 3 Administrative Scales used to identify test errors or unusual profiles. Once you are transferred to the Strong Interest Inventory® web site https://online.cpp.com, you enter your User Name and Password, and access to the web site is immediate. Order the Strong Interest Inventory® Report. There are three (3) editions: Standard (Adults), High School, and College. Order the Strong Interest Inventory® with Interpretive Report. There are three (3) editions: Standard (Adults), High School, and College. You know you want to change career direction or make a career choice, and you're ready to take the next step. When who you are matches the choice you make, you're more likely to be successful. We show you how to do that. 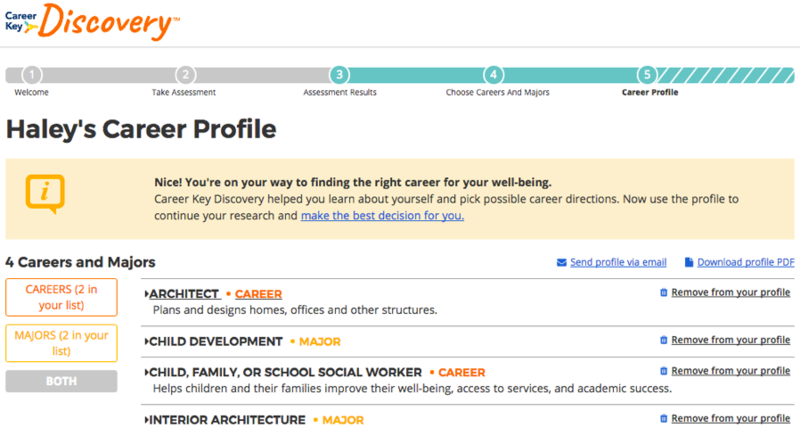 With your Career Key match, you're more likely to succeed and achieve career well-being. Research shows it. It's exciting you're taking steps toward lifelong career satisfaction – let us be your partner! 1. In about ten minutes, our scientifically valid assessment measures how similar you are to Dr. John Holland's six personality types. It assesses your interests, values, skills and abilities. Career Key's author is Dr. Lawrence K. Jones. 2. With the results, you identify your strongest personality types and groups of people at work or in school (personality environments) with whom you will thrive and enjoy compatibility. We give you personalized advice about what to do next. 3. 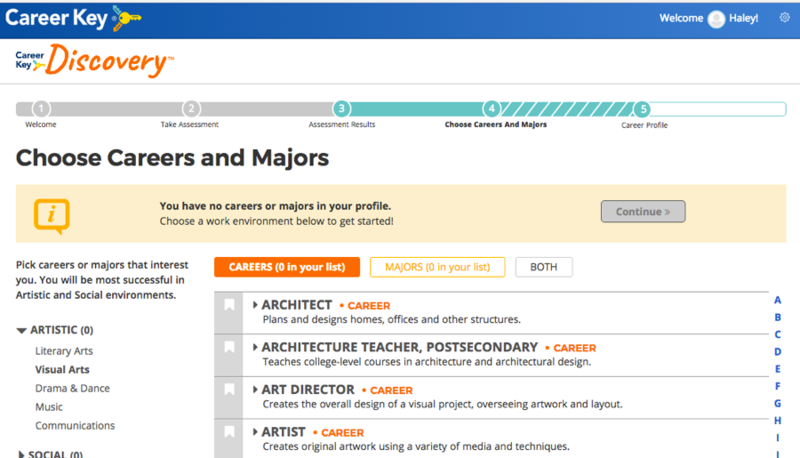 Next, explore and choose from careers and education options that best match your personality. Explore careers and education options that best match your personality. 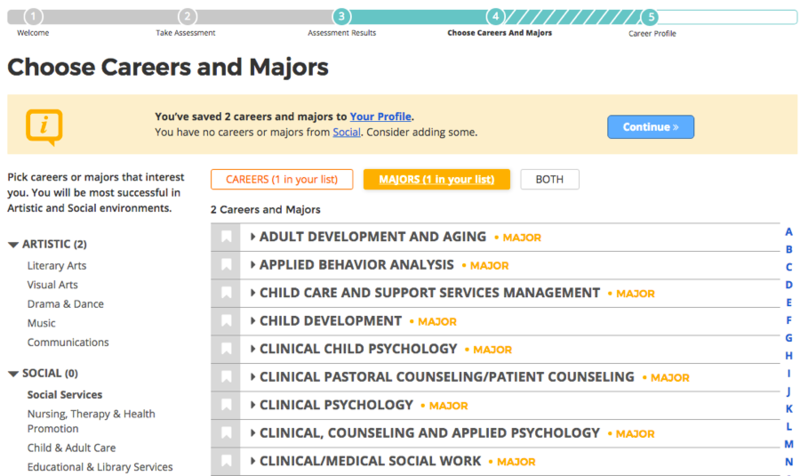 When you choose a career or major that matches, you're more likely to succeed and achieve career well-being. 1. 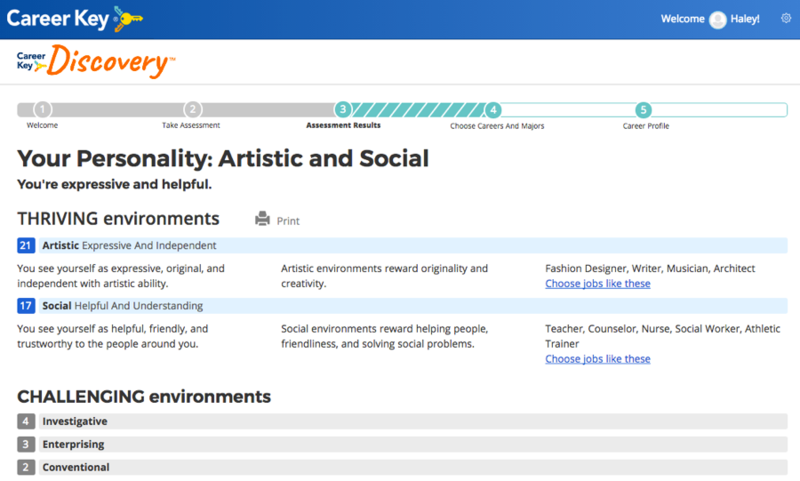 Now that you know more about your personality with your Career Key results, browse groups of careers sharing similar characteristics. This way, you discover more options that match, some you might not have thought about before. 2. Browse groups of majors, if you want to explore programs of study that match. 3. For each career and major, dive in further to learn more about each one. 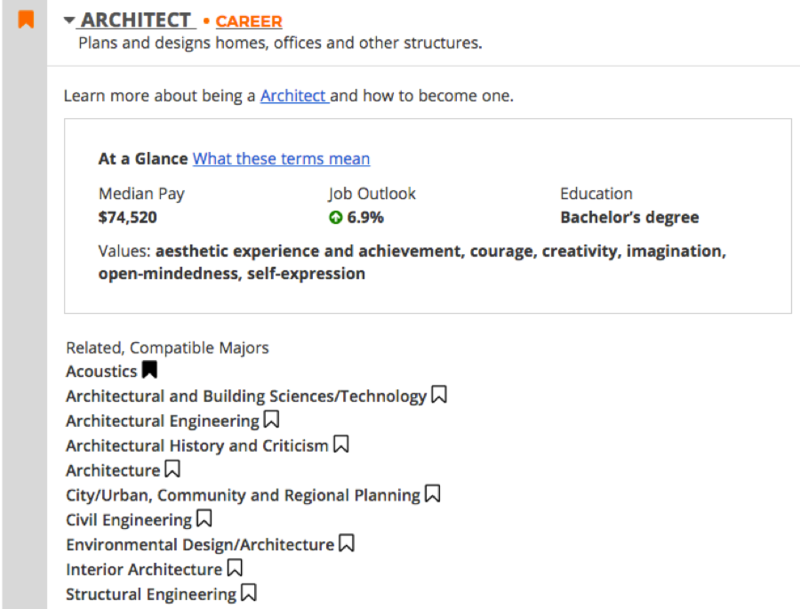 We also recommend related careers or majors that are compatible with your personality. 4. Save those options that interest you most to your Career Profile, which you can download as a report and email it to yourself. Return often to keep exploring and update this list and narrow it down further to the best fit for you. 5. 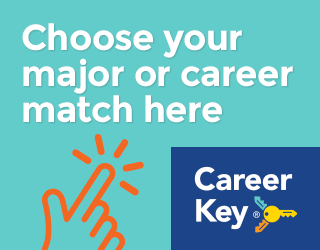 Take next steps to choosing a career or major knowing you've found a great match!